Mount Evans is one of 55 "Fourteeners" in Colorado - i.e. mountain peaks with summits higher than 14,000 feet above sea level. The summit of Mount Evans is at an elevation of 14,265 feet (4,348 meters). 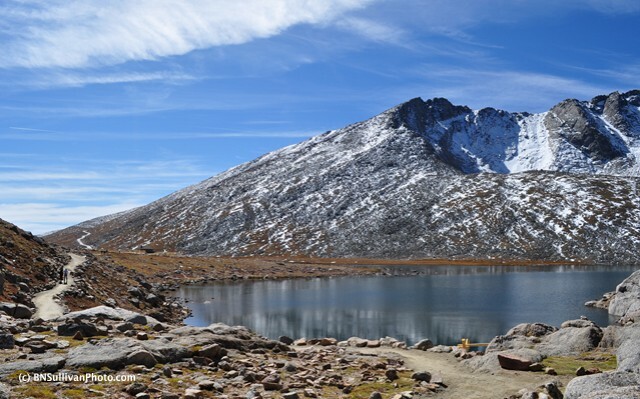 This small but picturesque alpine lake is situated somewhat below the actual summit of Mount Evans, but at an elevation of 12,830 feet, a hike along the trail that skirts the shore of the lake still can leave you a bit breathless! Here is a different view of Summit Lake, posted last month.